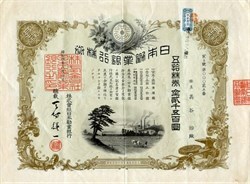 Beautiful certificate from the Nihon Kangyo Ginko Bank issued in 1929. 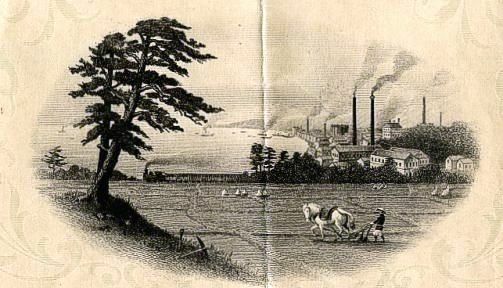 This historic document has an ornate border around it with a vignette of a farmer with a horse pulled a plow with a factory overlooking a bay in the background. This item is over 78 years old. The Nihon Kangyo Ginko bank was established in 1896 came to prefer making loans to industry in the course of the rapid development of the country, although they were originally intended for providing loans to co-operatives and other organizations for the promotion of both agricultural and industrial activities.